Location: The wall will be located at the entrance of the Football stadium. Number of Bricks: There will be a limited amount of bricks available in a first come first serve basis. Bricks: Bricks will be 4"wide x 8" long with three lines available for your personalized inscription. 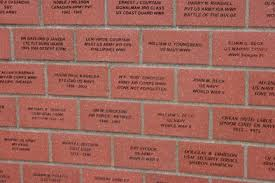 Feature: Three lines of inscription will be available on each brick. Fill out ORDER FORM found below. Description: Fill out this order form and mail it to the High School.